Posted June 11th, 2013 by David Porter & filed under Hot Topics, Social. 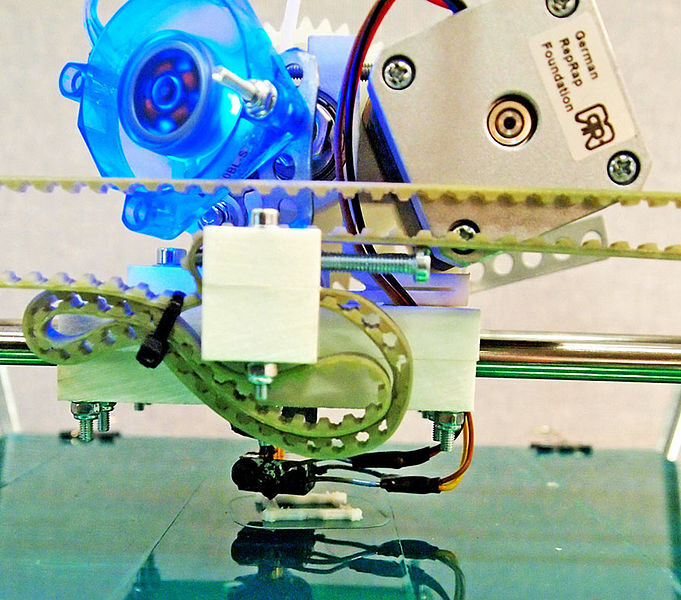 3D printers now set to revolutionise global economy? If you thought the digital age was revolutionary enough, stand by. After arriving as something of a fad, a good idea with masses of novelty appeal, 3D printing is now set to take the world by to an undreamed of level. This development looks as if it will turn progress in the worlds of medicine, engineering, manufacturing, retailing and maintenance completely on their heads. Already a gun has been made using a personal computer and 3D printing technology. This rather alarming assertion has been put out by Defense Distributed, a lobby body. The Liberator is a plastic-type handgun that will escape current airport detection technology. Instructions to make it are apparently downloadable from the web. It requires just 15 printable components, including a single metal firing pin, too small to be detected by regular scanners. With just a computer and the RepRap 3D printer costing about $1000 this gun can be manufactured using heated plastics instead of ink. It fires .380 calibre bullets and will concern security services around the world. Former UK police officer Brian Paddick said that criminals could currently more easily acquire a weapon than bother to print one which fires a single shot. But, the gun is untraceable and it’s early days yet. Soon multiple-firing weapons will surly follow. Leaving printing your own arsenal aside, the way it will overturn the laws of economics is that soon many people will print their own gadgets, implements and furniture. Why go out to buy a toothbrush if you can print your own at home? Bre Prettis, from an American company that makes 3D printers (the MakerBot Replicator 2 costs around £1500) said, ‘our motto is we make things that make things.’ He regards it as the next ‘industrial revolution’ which doesn’t get everybody’s agreement since some believe it’s all being over-hyped, but others are passionate, even evangelical about the possibilities. At the moment, it’s usually cheaper to buy mass produced items from a retailer, as now. To build up many layers of thin plastics takes time, energy and resources. The point is not now, but what the future of it makes possible. Already artificial limbs, hip replacements and false teeth are available. The next step is actual replacement body parts, which many people find distasteful. Unless they need a transplant and a human one is not readily forthcoming. He felt the benefits from the mass adoption of 3D, rather than trying to regulate it out of existence, will outweigh its costs. It challenges ‘top-down economics of mass production.’ Likening it to what has already happened in the services sector (Facebook, Twitter, YouTube, Amazon retailing) and the ability of self-publishing authors, film makers, music creators to sell directly to the public, manufacturing will now be decentralised. The conventional model of making lots of similar things on a big scale in one place then shipping them out at sale will have to change. Heath argued that there will be an ‘explosion’ in self-production and DIY manufacturing. Making your own things will be as common as cooking your own food. Of course, some will prefer to pay somebody else to make things for them. So the whole traditional manufacturer cycle could be restarted, but in tandem with the drastically altered self-making. The resultant army of apps and adaptations, hybrids and new angles will proliferate, making the benefits of economic experiment hard to deny. ‘The marketplace has fragmented into hundreds of niches.’ according to Heath.